Though I love to eat, I rarely cook. Cooking is stressful for me -- so many things happening at once, so little natural competency -- so if I'm the one in charge of dinner, chances are we're keeping it simple. (Tomato and avocado sandwiches for all!) This works out well because Ez loves to cook, and he's great at it. But then there's baking. 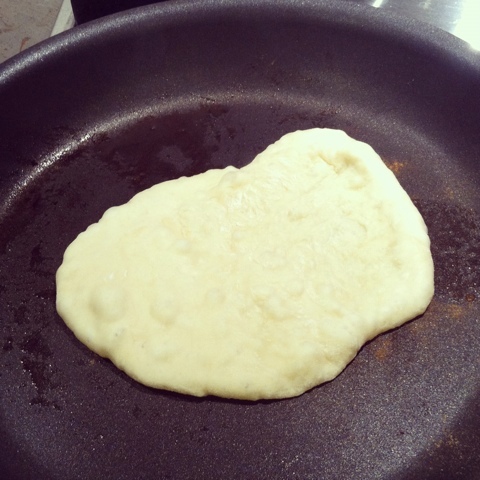 I like working with dough and batter; though there may be several steps and ingredients involved in the process, they all become one entity before the cooking actually starts. I follow the recipe, I put it in the oven, and I forget about it until the bell rings. (Clearly I'm not making complex souffles here.) But kneading dough? Therapeutic! And freshly baked cookies? A day at the spa. We've been eating a lot of Indian food lately, so to surprise the husband I found a recipe for homemade naan (thank you Budget Bytes and Pinterest) and decided to try something new this weekend. 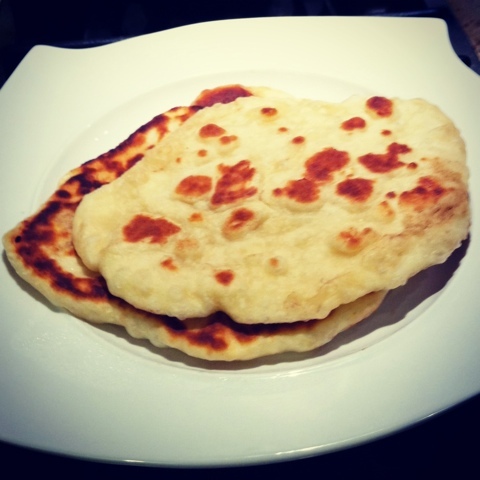 There was slightly more stress involved than simply putting it in the oven and forgetting about it (naan is cooked in a skillet like a pancake rather than in an oven, so I guess it's not really "baking" per se) but it was easy and satisfying. 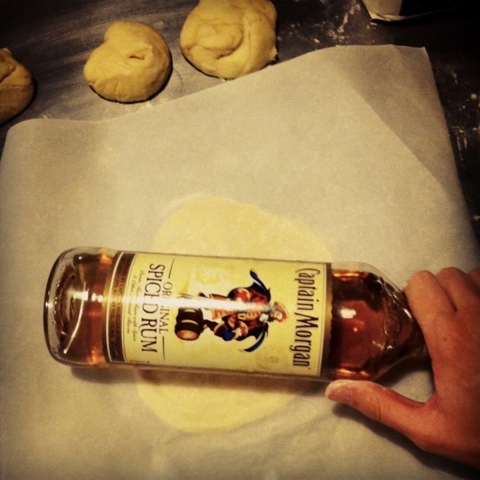 In fact, the only real problem I ran into was not being able to find my rolling pin, but I solved that problem quickly. I think there could've been more bubbles, so next time I will warm my ingredients a little more to try and kick the yeast into high gear. And I'd like to try a whole wheat version too. (Though hopefully someday soon science will tell us that simple carbs and white flour are superfoods that we MUST HAVE FOR EVERY MEAL.) But for now, let's call this a success. A low-stress, husband-surprising success. The two of us ate all eight pieces within 24 hours.